There’s a few free tutorials on the Molly and Mama blog for some shamrock inspired craftiness! And with Saint Patrick’s Day not far away, you’ve got just enough time to create one of them (or a few)! 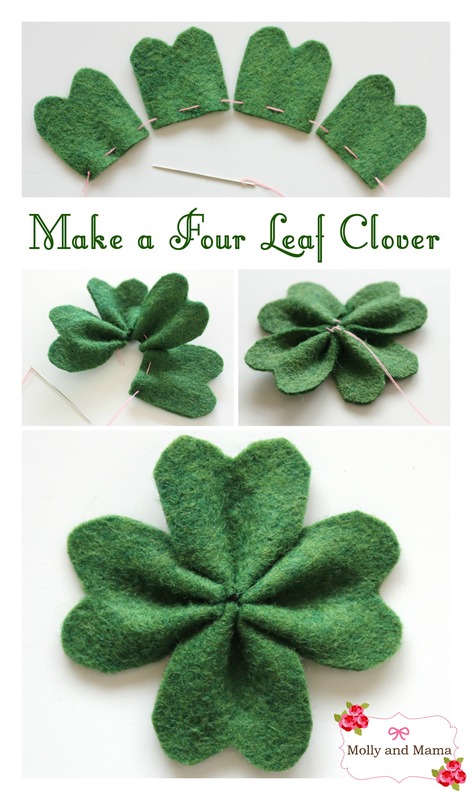 You’ll need to make the basic felt four leaf clover and then use it for the clip or pin cushion projects. You can create a clover inspired hair clip that looks pretty enough to be worn all year ’round. Follow the tutorial HERE. You can also use the same process to create a pin cushion top. The full tutorial can be seen HERE. I love this colour combination. Pink and green is my favourite! And if you’re a lover of pin cushions, you could also stitch up this pretty piece I created last year. It’s made with fabric scraps and vintage trims. So sweet! Pop over HERE to find out more. Have fun with these projects. Feel free to share any of your creations on the Molly and Mama Facebook Page. I’d LOVE to see them! Because I love Saint Patrick’s Day craft! I hope you have a lucky day on the 17th of March!